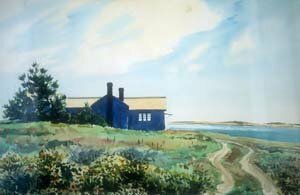 Sandy Low was co-founder of the Connecticut Watercolor Society and its President for nine years. 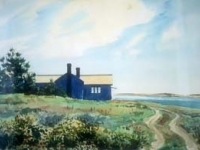 He was also President of the Association of Connecticut Artists, an elected member of the Salmagundi Club – the oldest art club in the United States – a member of the American Watercolor Society, the New York Watercolor Club and President of the Connecticut Academy of Fine Arts. 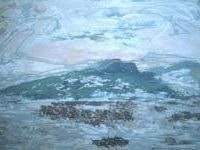 One of his paintings was selected to represent Connecticut in the 1939 World’s Fair. 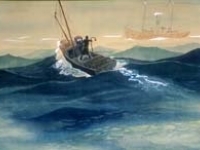 Sandy began working in oils, and then became a well known watercolorist. He experimented with acrylics and wood sculpture. In 1939 he was asked to be a member of the Board of Directors of the New Britain Museum of Art. In the beginning there were only 24 paintings in the collection. Sandy became the museum’s first Director, holding that position until his death in 1964. Under his leadership, the museum became one of the finest small museums in the country, acquiring more than 1500 works of art – many of them recognized today as masterpieces. Martha’s Vineyard Island, one of Sandy’s favorite places, reminded him of his beloved Hawaiian Islands. He became a consummate fisherman. 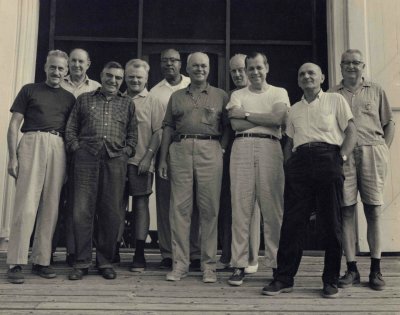 Every year he gathered a group of artists, shown in this photograph, to paint together for a week. Steven Dohanos (third from left) is a well-known illustrator. The pugnacious, tough-looking gentleman (fourth from right) is Jim Cagney – the actor – a gifted amateur painter. 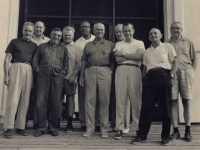 Louis Fusari (second from left) was an art teacher, a restorer of fine paintings and a resident of Harthaven. 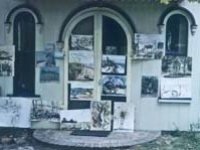 At the end of their stay in Harthaven, the artists displayed their work on the porch of Sandy’s gingerbread house. Most everyone came to drink gin and tonics and old-fashioneds and admire their work. 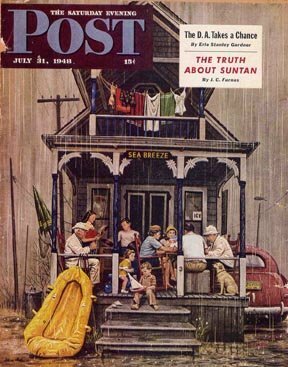 Harthaven achieved a moment of national fame when Steve Dohanos’ Saturday Evening Post cover appeared in July 31, 1948, depicting a Harthaven family waiting out a rainy day. 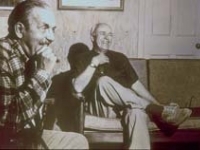 The composition was first staged on the front steps of the Vibberts’ home. 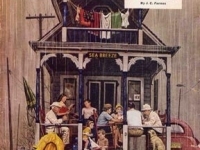 Using artistic license, Steve later changed the house to one he found in Oak Bluffs. Pictured on the cover are (left to right) Walter H. Hart, Mr. Dohanos’ daughter-in-law, his son and grand daughter, Sam Low (on steps), Virginia Low, Phronsie Conlin, Jack Vibberts, Frank Vibberts and Deke the dog. 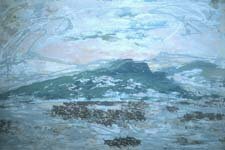 Sandy’s Vineyard connection led to one of the most amazing acquisitions of a work of art by a small museum – or maybe even a large one – the five Benton Murals which were acquired from the famous Whitney Museum in New York in 1954. Tom Benton was a “regionalist” artist. He traveled through our country to put his finger on America’s pulse. He painted life in the raw – dance halls and cowboys, business tycoons and poverty stricken farmers. Today, he is considered one of our country’s greatest artists. 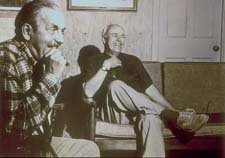 Benton and Sandy became fast friends on the Vineyard which led Benton to help Sandy acquire the murals for the New Britain Museum of American Art.